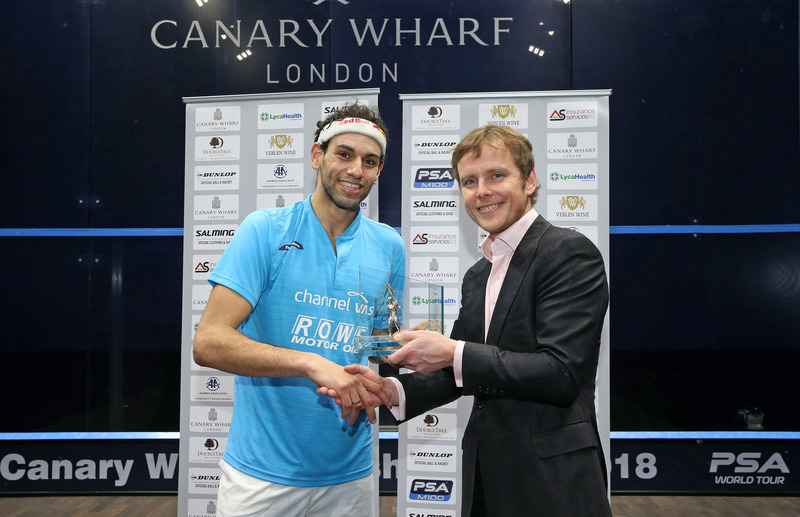 World No.1 Mohamed ElShorbagy became the first ever Egyptian winner of the prestigious Canary Wharf Classic after he defeated compatriot Tarek Momen in a thrilling five-game contest inside London’s stunning East Wintergarden to bring an end to the 15th edition of the PSA M100 tournament. World Champion ElShorbagy, who returned to the summit of the World Rankings earlier this month, has been in stunning form this season and was appearing in his eighth PSA World Tour final of the season, while his meeting with Momen was a repeat of November’s Qatar Classic, which also went ElShorbagy’s way. A captivating contest saw some incredible rallies enrapture a sell-out crowd, with ElShorbagy pulling ahead to a 2-1 lead, only to see a gutsy fight back from Momen send the match into a decider. 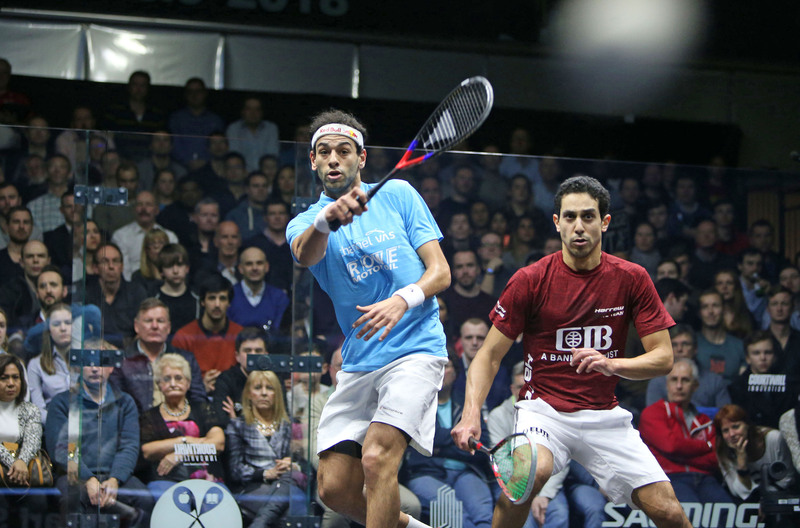 But a determined ElShorbagy ran away with things in the fifth game as he rattled off a succession of points to complete an 11-8, 7-11, 12-10, 9-11, 11-3 victory to draw a captivating 86-minute battle to a close. The 27-year-old ElShorbagy, who has lost just one of his last 31 matches, has now won an incredible seven PSA World Tour titles from nine tournaments this season, while his triumph in East Wintergarden was the 32nd PSA title of his career – a total which puts him joint 11th on the list of all-time male PSA World Tour title winners. “This is the best ever match we’ve played against each other and what a venue to play that kind of battle in,” said ElShorbagy. “The crowd have been supporting us all week, they come to support this event every year, so it’s amazing to play such a high quality match like this with Tarek and the crowd made it more exciting for both of us. Reflecting on the brutal nature of the PSA World Tour, he added: “Myself and Tarek are going to Switzerland and if we both win our first round then we get to play each other in the quarters. I hope that we stay away from each other after that because I don’t want to play him many more times after this, otherwise we’re both going to retire early. “I want to thank the sponsors of the tournament who have been great every year. Hopefully one day we can have a women’s event at the same time, it’s always stronger to have a women’s and men’s event at the same time. “It’s always a stronger Tour together and the PSA have been doing a great job and the Tour has been in a great place. It’s been getting better every year and all the players need to thank them. Momen said: “The only thing that’s bothering me is that I’ve been in this position many times. I wish I could go on this court once holding the trophy, but for me to get to this stage I have to play against so many great players, so it’s hard to get the successive wins. “This is the best ever match we’ve played against each other and what a venue to play that kind of battle in. “The crowd have been supporting us all week, they come to support this event every year, so it’s an amazing to play such a high quality match like this with Tarek and the crowd made it more exciting for both of us. PSA M100 2018 Canary Wharf Classic, East Wintergarden, London, England.